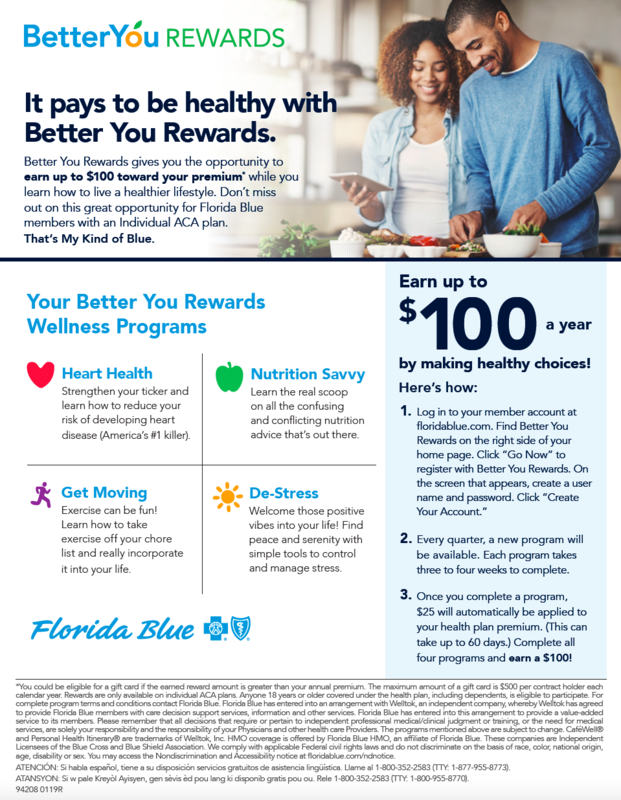 Starting in January, if you’re enrolled in an individual or family ACA health plan (not Medicare, a temporary plan or a plan through work) you can earn up to $100 each year toward your premium just for completing programs designed to help you live a healthier life. Everyone can use a little encouragement, and a little money, and as part of our Better You Rewards program, you can earn $25 each quarter when you complete an online wellness program. With program topics like nutrition, exercise, heart health, and stress relief, you’ll learn something new that you can really use. We’ll make it easy for you to track your activity progress anytime, anywhere! Log in to your member account at floridablue.com. Find Better You Rewards on the right side of your home page. Click "Go Now" to register with Better You Rewards. On the screen that appears, create a user name and password. Click "Create Your Account” then answer a few security questions. Welcome to your Better You Rewards personal page!